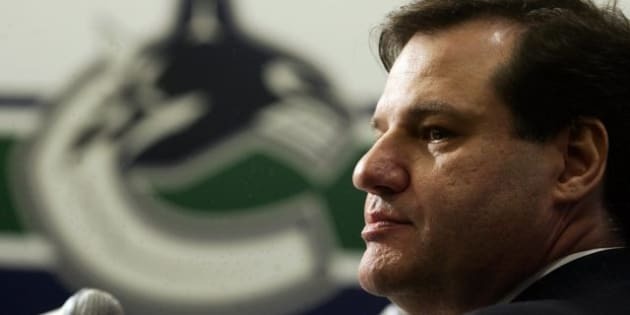 VANCOUVER - The lawyer for a co-owner of the Vancouver Canucks says he is asking a judge to seal "commercially sensitive information" and take practical steps to prevent it from arising in the form of questions during an upcoming divorce trial. The trial between Francesco Aquilini and his estranged wife, Taliah, is scheduled to begin Monday, but legal wrangling has already generated headlines as the couple fought over a prized wine collection. George Macintosh said in an email Wednesday evening he is seeking an extension of an August 2012 order by BC Supreme Court Justice Nathan Smith that established the process the parties must follow to have documents declared confidential. "Essentially, we are only seeking an extension of the order ... which is essentially to seal commercially sensitive information and take practical steps to have the lawyers at trial, through their questioning, not divulge such information," he said. Earlier in the day, Francesco Aquilini tweeted a link to a statement he made, saying his lawyers will seek orders to protect the confidentiality of private family and commercial interests. "During this trial, protecting my five children will be at the heart of everything I do relating to both custodial and financial matters," he stated. "While I can personally withstand the impact of media coverage, it is simply not fair to have my children exposed to the effects of sensitive family matters being aired this way." He said he was confident Taliah Aquilini would agree that an order was in the best interests of their family. Both parties agreed in August 2012 not to file affidavits relating to their children, and Smith has already ruled Francesco Aquilini will not be forced to testify about any alleged adultery.